That’s a worthy sentiment to start a rap release with. 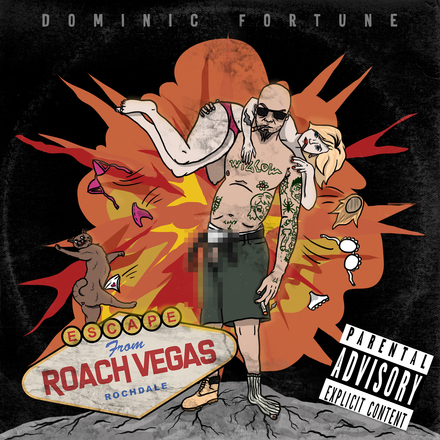 Dominic Fortune is Manchester, UK artist who according to his press release is “well known as Freestyle Fictionary’s legendary Schizaflow.” I think I’ll defer to Grant Jones as to how legendary he is amongst the UK’s hip-hop scene given I’m a yank, but he definitely has the sound of a Manchester native. Apparently he’s decided to leave that life behind though and “live the life of a recluse in Sweden,” which accounts for his new moniker and this new EP. Before his big life change took place I did find this clip of him at a freestyle battle. Unfortunately it’s harder to find more under his current nom de plume as he shares a name with a Marvel Comics character. To be fair Fortune (Duvid Fortunov) is a minor player in the larger Marvel sphere, but I still hope Schizaflow has all the trademark issues sorted, or he might wind up hit with a cease & desist from Marvel’s legal team. Either way if you try Googling “Dominic Fortune” 99% of what you find is going to be related to the comics and not to the rapper himself. On this short (16 minute) EP, Fortune works with Quantum Mechanix to provide the beats. Since they’re known as a “drum and bass” crew the result is understandably bass heavy and techno-futuristic on songs like “Bleedin’.” Here Mr. Fortune once again espouses that his “keeping it real” aesthetic and what I can only read as a disdain for capitalism — or at the least for the rich who steal from the poor. Now look at all the havoc they are wreaking! The rhyme structure is a tad simplistic but not to the detriment of the point that Fortune is trying to make in the song. Elsewhere Fortune spits bars to an up tempo riddim on “Man Up,” calling on other people in the scene to have more cajones and presumably be more like him. He’s also pledging to take that challenge himself: “I’ve got to do better, I’ve got to do more… my fate’s in my own hands, if I don’t make plans, I’ve got no chance.” I can dig it. The aptly titled “Rain” closes out the presentation by starting out like a thunderstorm and keeping the sound of water hitting the pavement in the instrumental throughout. One thing I take to heart about Fortune/Schizaflow is that he may be a Manchester boy but I doubt that American yanks (or wanks) would have a problem understanding his delivery. The dialect makes some of his vowels a bit longer but the meaning comes through quite clearly. Overall I’m left with the impression that Fortune was happy with his freestyle reputation but sought to take things to the next level as a proper artist (signed to Proper Sound Recordings) and this is a good start.